2016 Scar of the Sea, Pinot Noir, Seven Leagues, Santa Maria Valley. 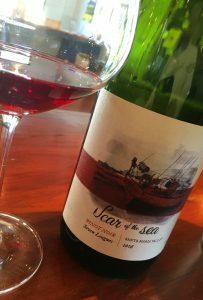 Scar of the Sea wines is a small production wine and cider label, that developed between long-time friends and colleagues, Mikey Giugni and Michael Brughelli. These guys believe the most important part of their wines and their cider is where they are grown, and how the location, climate, and soils matter. These are wines and ciders that are crafted with minimal manipulation, all with the purpose of making easy to drink and transparent in style, and as they put it, all the vineyards and orchards are influenced by the closeness to sea, with maritime soils, and climates, producing Pacific Ocean infused wines and ciders that are unique to the Central Coast of California. I have had a few of their wines in recent years, each shows good delicacy and gracious cool climate fruit, and this 2016 is one of the best I’ve tried from Mikey Guigni and Michael Brughelli, it’s open and generous on the palate and with beautiful balance and length, very impressive stuff. This pair loves surfing and the outdoors, with Michael and Mikey noting that they met while Mikey was in his final years of college at Cal Poly, becoming thick as thieves, based on their shared interest and fascination in wine and the ocean. Getting started, Michael worked as a winemaker at Kenneth Volk Vineyards, learning about the Central Coast terroir and Giugni went on a winemaking and maybe a bit of surfing adventure to the southern hemisphere that included a stint at Pipers Bridge Winery on Australia’s remote island of Tasmania, where he also learned to make ciders. That trip left a deep impression and helped spark the creation of Scar of the Sea, interestingly the name came from a sign on an old gate that Mikey saw on his trip, though he didn’t know the real translation actually was Star of the Sea since it was written in ancient old English! This 2016 Seven Leagues Pinot Noir by Scar of the Sea comes from selected picks at both Bien Nacido and Solomon Hills Vineyard, all fermented with native yeast with this cuvee getting about 25% whole cluster and raised in close to 20% new French oak barrels with 14 months of elevage. Clearly a lot of the grapes for this gorgeous Pinot were from old vine plots from the famed Bien Nacido Vineyard that was first planted to Pinot Noir back in 1973, making it one of the oldest vineyards in the region, as the wine here has lovely complexity and concentration, the part that comes from the Solomon Hills, which is the western most vineyard in the Santa Maria Valley appellation, and the coolest of all vineyards in this growing region adds striking precision, deep color and vibrant acidity keeping things wonderfully focused. The nose has lovely rose petals and primary red fruits along with a hint of earth, spice and subtle wood notes before the attack unfolds with an opulent assault in the mouth delivering a vivid array Pinot flavors in a medium weighted wine that shows black cherry, raspberry, plum and background of pomegranate and cranberry fruits along with a faint hint of heirloom tomato, chalk, vanilla and orange tea. All this is wrapped up in a satiny body with a pretty garnet/ruby hue, making for stylish and well crafted Pinot Noir, it is really drinking fabulous right now, it should age well as well, this is a winery to watch and this wine is one that shouldn’t be missed.